This solution is based on the data from Shipping logistic, Shipment budgets, number of Shipments, origin and destination of Shipments - it highlights the revenue generated and expenses for every state in India, narrowed down to districts of that state. First Visualization: This visualization shows the total expenses for the country. We have a line chart below the total expenses which highlights the various States and their expenses and accordingly we can see a trend of greater revenue and lesser revenue. 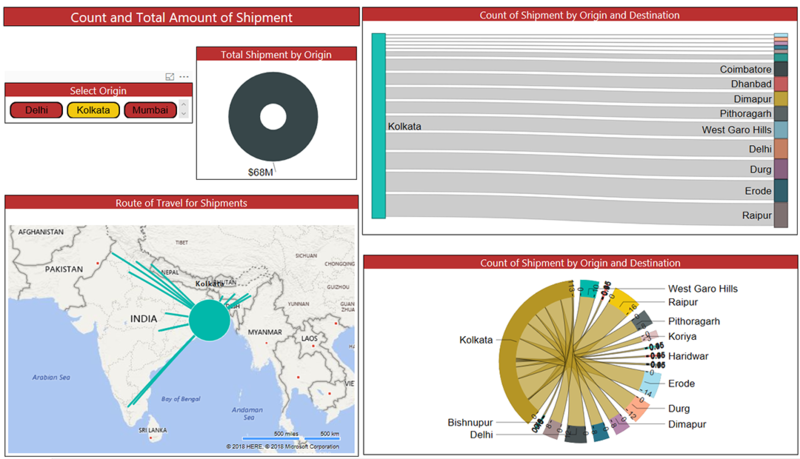 This Aster custom visualization highlights the Total amount of Shipment from the three different cities of Delhi, Mumbai and Kolkata. The size of the pie is proportional to the amount of the Total Shipment. 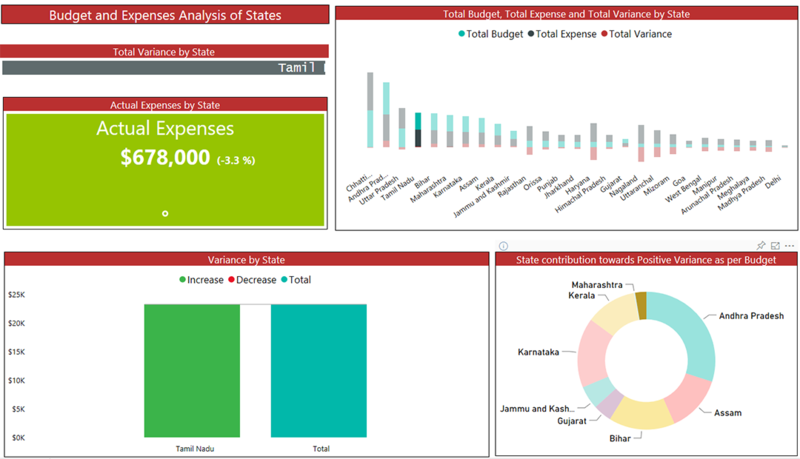 Second visualization: This ribbon chart highlights the Total Budget and the Total Expenses for every State. We have also created a calculated field showing the variance between the Total Budget and the Total Expenses. We can color code the visualization so that different measures are shown in different colors. 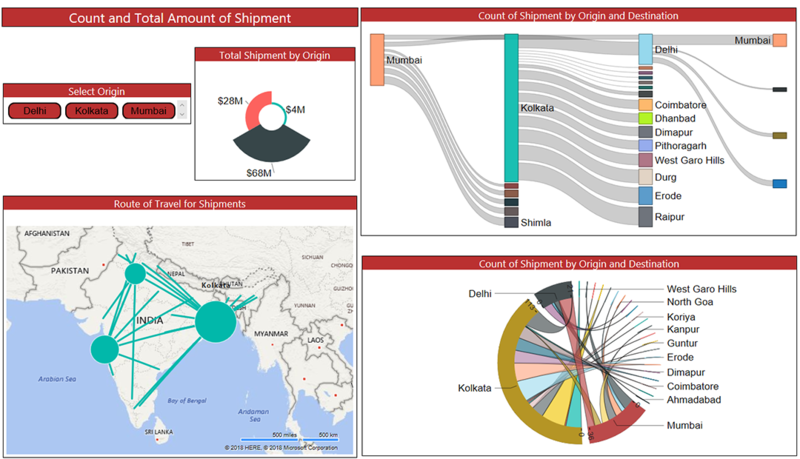 This custom visualization is known as Sankey visualization and here is showing the origin of the Shipment and their destination. This visualization is highlighting the number of shipments from the Origin and showing its Destination. Third visualization: This visualization is completely based on the Total variation (calculated field) for different Sates. We can easily figure out which State has a negative Variance (highlighted in Red), positive Variance (highlighted in Green), and the Total Variance. 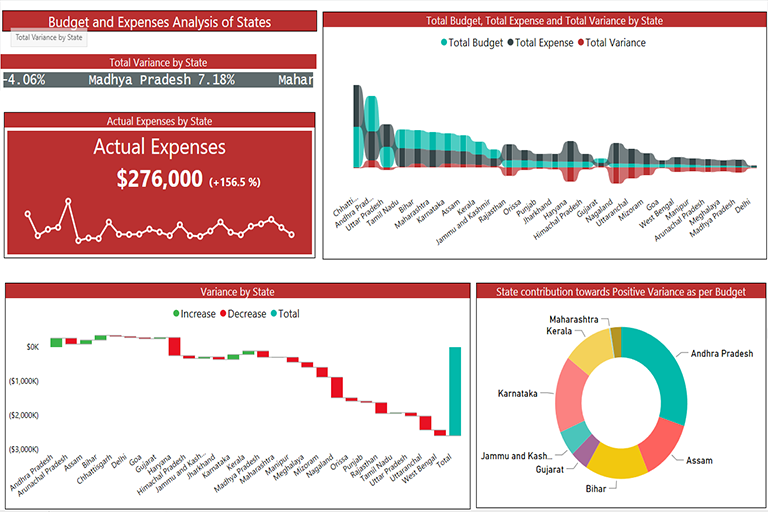 Waterfall Charts are useful to highlight the negative and positive. Fourth visualization: The donut visualization highlights the percentage share of the different State which contributed towards the positive variation in Total Expenses. This visualization only highlights the State with the positive variation of Total Expenses and the percentage contribution towards the Total Positive Variation. The third and fourth visualizations are also highlighting the Origin and the Destination of the Shipment. For the visual effect we can use the Map view where the Origin is highlighted with a filled circle and the destinations are marked with the bold lines. 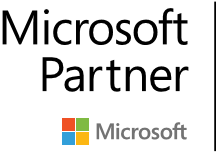 The scroller highlights the Total Variation of every State including the positive as well as the negative Variation of the States. Additionally, Chord visualization highlighting the same data. It shows the same details and the data sets but in a different way. It is up to the end user which visualization suits the best for the dataset, and a page level slicer with three origin cities allows the data to be filtered out by selecting the various cities (single or multiple) in the slicer.